Ridley Scott’s long awaited return to the Alienverse brings with it a host of expectation and the promise that after years of mistreatment one of cinema’s most terrifying creations would be returning to the care of one of its creators, someone who understood its power and potential, with the desire to revisit and expand the world which influenced almost every science fiction film which followed. I’ll keep spoilers at bay with one caveat which I’ll place at the foot of the review. 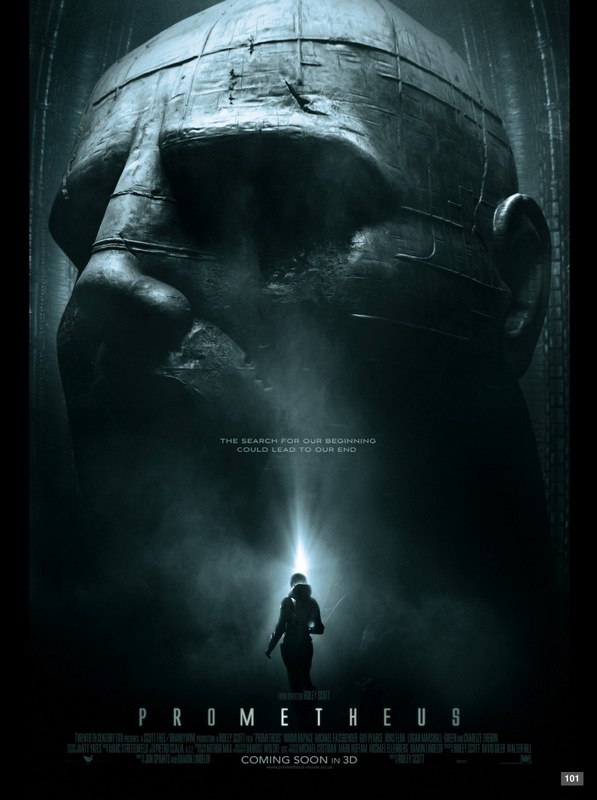 In an attempt to distance Prometheus from its Alien origins Ridley Scott made much of the sudden shift during the writing process when the film turned from a straight up prequel to his 1979 film into a new story told in the same universe. It was to share DNA with its spiritual forebear but it was, we were told, something new. This is only partly true, and the success of the film lies in the fact that it doesn’t stray too far from the formula established thirty-three years ago, however this leaves us with a landscape of missed opportunities. We have mystery and spectacle with a host of knowing nods to Alien and while it’s another fascinating walk in the world Scott created all those years ago the promise of deeper narrative and emotional engagement is lost, and it is lost early on. Journeying through space to a constellation corresponding to mysterious cave paintings discovered on Earth, made by civilisations who lived centuries apart and who had no contact or knowledge of one another, the spaceship Prometheus carries the scientists who discovered the symbols in the caves and a bevy of Weyland eomplyees. Their mission is to find out who or what inspired the paintings, and the origins of the giant human figure which appears in each one. Landing on a moon orbiting a distant planet the crew of Prometheus uncover an alien structure and investigate for signs of life and, it is hoped, answers to the most fundamental questions of human experience. It’s safe to say that things don’t go according to plan, and the fallout is catastrophic. What Scott creates is a very believable return to the world, with an intriguing prologue and, early on, a genuine sense of discovery which propels scientists Noomi Rapace and Logan Marshall-Green and the rest of the crew to this distant world. Discussions of faith and the repercussions to that faith if the mission succeeds in finding the origin to human life is an element of the film which engages early on. The introduction of the android David veers from the playful to the tragic effortlessly – the absence of a soul is stated with a cavalier attitude and with such fertile ground laid it seems at first if Scott is making good on his promise to offer us a rich and mature exploration of human experience in the guise of a sci-fi action film. Sadly it is not to be and after a promising start it quickly becomes simply another Alien film, albeit a fast paced and well-directed one, and fans of the series are well catered for with links to the original film occurring as organically as possible and yet it feels like safe ground; we have seen much of this before and it is not as unique a story as hoped. There are very few surprises here, not in terms of the mythology and origins of Alien, but in the storytelling, the dialogue and the characters we follow. Several of the big reveals seem unnecessary and have little emotional resonance, almost added as an afterthought to engage when there were far more interesting elements at play all the time. There’s very little of the underlying anger of Scott’s previous work, and it is odd to see the director chose not to take the path less travelled by. The film looks excellent and the 3D adds to the initial experience – flying though space and the early exploration of the alien ship is incredibly engaging. Michael Fassbender’s David is also a highlight, with a nicely duplicitous undertow occasionally breaking the calm surface of his well-tempered economy of movement and register of emotion. The fragility of Noomi Rapace’s character is down to her ability as an actress rather than the role she is given, yet she delivers a fearsome performance and carries much of the film on her shoulders. I could have done with more of Idris Elba’s weary Captain Janek and there are some nice character moments scattered throughout and there’s not a boring moment here. To be clear this may not be a prequel to Alien, but it is an Alien film and whereas Scott’s first dalliance with the eponymous creature was a perfectly pitched study in terror coming in the afterglow of Star Wars Prometheus is a victim of the film’s influence. We’ve seen this story before and the very elements which could have elevated it to what I believe was the initial intention are jettisoned, and the film suffers because of it. It’s a well made film, that’s in no doubt, and Alien fans will find much to enjoy here but Prometheus hasn’t the edge, nor the conviction, it needs to fulfill its promise. Next articleFull E3 Games List is Here… and Just the Ones We Know About.